ICSA has stepped up pressure for a “greater response” to the fodder crisis in a meeting with members of the Oireachtas in Leinster House today. · The immediate rollout of meal vouchers. · The introduction of a low interest loan scheme for small and medium sized farming enterprises for working capital. · All outstanding farm scheme payments to be made immediately. · Flexibility around the terms of targeted supports such as BDGP and the Sheep Welfare Scheme, including flexibility on inspections. “The provision of low interest loans must be made a priority. We urgently need to deliver working capital to farmers who can’t access any more credit. The situation is particularly acute for cattle and sheep farmers, many of whom are experiencing difficulties with merchants, co-ops and banks. ICSA wants to see priority given for working capital of up to €10,000 for as many farmers as possible instead of funds being hoovered up by a smaller number of bigger farmers, as has happened in the past. “ICSA is also demanding flexibility with regard to the BDGP scheme where farmers have been forced to sell stock which in turn could cause difficulties with the terms of the scheme. Sheep farmers heavily impacted by the snow will also have to be accommodated and leniency will have to be shown to those who have a shortfall in numbers. The ICSA delegation, which also included ICSA beef chairman Edmund Graham and ICSA suckler chairman John Halley, attended the Joint Oireachtas Committee for Agriculture hearing in the Dail later in the day. 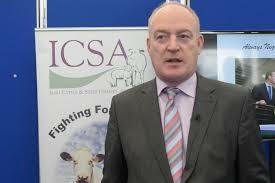 “ICSA will also be meeting with Minister Michael Creed tomorrow, Thursday, for further briefing on the issues,” he said.